Megan Smolenyak is undoubtedly the most internationally well-known genealogist. A storyteller at heart, the tales of her projects resonate with audiences regardless of geographic boundaries. I have often wondered what makes Megan so successful. I've always wanted to ask her what she felt were the keys to her success but honestly I've never had the guts to do it. Now that I have finished reading her latest book Hey, America, Your Roots Are Showing (review will be forthcoming) I think I now understand some of the basics to her success without having to ask her. If you read carefully it's all right there in print. If you are a professional genealogist I'm guessing that you are running a business of some sort. You are either trying to make a living taking clients, writing articles or books or acting as a genealogical educator or speaker. With that in mind, there are many aspects of Megan's success that we can learn from to help improve our own businesses. This article is not intended as a "Isn't Megan Great!" article but rather a serious look at extrapolating a person's business success and incorporating and learning from those lessons. Here are some key points that I learned from Megan's book that we can all apply to our own businesses. One thing I noticed about the source of Megan's projects is that she reads a newspaper and that often generates ideas for new projects. That may sound like a really simple thing but it's key when you think about it. When I look at my own habits, I don't regularly read a newspaper, watch tv or movies for that matter. With the advent of the internet, where we get information has become segmented. We now follow specific channels rather than the main networks. We get our news online and filtered just the way we like it. We are missing the big picture of what is going on in the world when we do this. Reading a general news source such as a newspaper or news magazine will remind us of everything going outside of genealogy, our family, our local region or our other interests. It could become the source of your next project. Transformation is the key next step. Don't just read the newspaper. Expand upon it and think outside the box. Many of Megan's projects come from news stories that are not related to genealogy. She found stories that piqued her curiosity and discovered a way in which she could apply her genealogical skills to solve a problem. Think of how she applied her genealogical skills to help coroners and start the Unclaimed Persons program. Reading the newspaper also led to Megan's interesting work with the FBI. Megan harnesses a non-genealogical story, formulates an idea and the applies her skills to it. Whether done casually or in-depth, she jumps right in and starts researching the topics that pique her curiosity. I'm sure there are many side research ideas that didn't pan out for her, but some of them have led to major projects. If you see something that piques your curiosity from the newspaper go with it. Do some basic research and see where it leads. At this point, however, let me say that you should have a well thought out business plan. Have you identified your target projects? You should have identified what your niche is and what type, location or time period makes up your focus. Following your curiosity is great but it should be supporting your well laid out business plan not taking you on an unrelated tangent. Have your ever considered calling a reporter? Would you ever have the guts to call the FBI? Would you cold call the descendants of a historical figure that you are researching? This kind of outreach can be unnerving. We can give ourselves all sorts of excuses not to do it. Megan consistently reaches out to people she doesn't know. I suspect her need to solve the mystery is greater than her fear of being rejected or being thought crazy. We need to overcome our fears and reach out to those that can become out of the box clients or stakeholders that can help solve our puzzles. This is exactly how Megan got her job with the FBI. She picked up the phone and reached out to them. You can do it too. One of the major underlying themes of the book is Megan's belief in herself and her ability to solve a mystery. I think you believe in your abilities too. How far will you allow your confidence take you? In the case of Annie Moore, the first person through Ellis Island, Megan was trying to identify Annie in a photograph. She contacted Ellis Island and they flat out said basically that's not her, it was taken in the wrong location. How many of us would have abandoned the search at this point? Megan believed that she really did have a photo Annie Moore and went to great extremes to try to prove it despite what the folks at Ellis Island said. We need to harness the strength in our own skills and allow that to translate into confidence that will thwart the naysayers in appropriate circumstances. Learn when to walk away and when to stick with it. At times Megan has had to invest in herself. When no one else sponsored her projects, she sponsored them herself. Over the years, Megan has spent her own money on researching projects she believed in. Initial investment is key to starting any new business. Perhaps as genealogists we need to re-think investing in ourselves and our own businesses. And I'm not just talking about buying business supplies. If your curiosity is piqued by a history mystery, you may have to invest some of your own time and money to make the project become a success. Consider it a business expense and get started. If it fits within your business plan and you believe it's worthwhile then don't hold back. Genealogists love details and footnotes! But sometimes we get so mired in the tiny details that we don't step back and enjoy the story. Genealogists have great stories to tell. 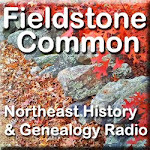 Many people would enjoy hearing these stories whether they are other genealogists or just folks who enjoy a good tale. Step back from the details and learn how to tell an interesting story. Megan has made a career of this. You don't have to sacrifice great genealogical research to become a good storyteller. Author Diane Rapaport is another wonderful example of this. Don't be afraid to share your stories! You can write the stories yourself in an article or a book or you can contact a reporter who could be "your voice." If your client work has led to fascinating stories don't be shy about contacting the client for permission to publish. Perhaps they will be flattered by the offer. Think back over your projects from the past year. How many of them can be transformed into great tales? Now count up how many of them you have shared beyond yourself or your client. Instead of reinventing the wheel draw on your vast supply of completed project work. Business success, regardless of your line of work, is all about thinking outside the box and finding underlying themes or needs that others miss. When I set out to read Hey, America, Your Roots are Showing I never expected it to be a guide to success. Learn to look beyond the obvious message as you process the world at large and you will change your business and your life. I have always been attracted to Megan because she IS a model of successful professional attitudes. I think she's a great role model! Megan owes you a nickel - I just bought her book because of your post! Excellent post. Just about to remove from my Amazon wish list & order it. Hope the UK site has it in stock! So true. I have known and worked with Megan since 1999 when we first worked on a story for one of her first books. A super person!! I do want to clarify that this is not a book written specfically for professional genealogists. This is a collection of project stories that is appropriate for a broad audience. I like how you extracted what Megan does in order to produce what she does. I have some of those habits already. I've been shy about sharing my stories, but I'm going to be gung-ho now. I've written two articles, but I need some discipline to blog, and I attended your talk about that so know it doesn't have to be a tome everyday. I will be presenting a story at ACGS in April, so thanks for the helpful motivation! I enjoy other people's stories, time to share. Also time to buy the book! I actually ordered this book a week ago. According to Amazon, I should get it the first of next week. Now I really can't wait. Great analysis of Megan's book, Marian. I have ideas churning around in my brain now - and I'm sure you do, too! Thanks for another wonderfully interesting post. I *have* called the media with a few different gen-related story ideas. Every single reporter called me back and was interested and friendly. Folks, don't be shy about calling! 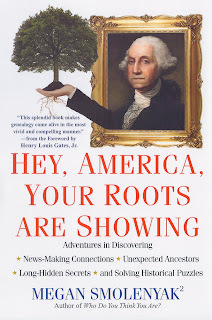 Many reporters realize genealogy is "hot" and they will be grateful for the story idea. There's been a lot of talk about whether gens should toot their own horns - or not. I've never directly gotten any business from being mentioned in articles. I did, however, get some very nice clips for my web site (which may lead to later business), AND I helped educate folks about gen-related stories in their own hometowns. Not to mention the personal satisfaction from tackling a local mystery AND meeting cool people. It's a win-win all around! So, toot away! It's good for you AND the profession! Living in NJ I have been fortunate to attend a few lectures conducted by Megan. All you state is true. The last talk was last spring and the subject was using DNA for genealogy. She is a great speaker, very entertaining as well as extremely knowledgeable. However what really got me was her ability to get people to give up their DNA, I kept thinking if I could only hire Megan to convince my family members to help! She doesn't seem to let anything get in her way, and clearly thinks out of the box. Hoping to catch her at a book signing. Thanks Marian for sharing your insights into what makes Megan so successful. Well done! Thanks, gave me a new perspective. Hi Marian, thanks for the post and the reminder that we should be self-Motivating. It's always nice to see and hear about successful people's experiences, especially when they are in our own backyards. I look forward to reading about her experiences in her book. Back in 2007, I coined the phrase "doing a full Megan" and of course she has outdone herself since :) Another rising star in this year of the story is Mary Penner. Mary is doing an APG webcast this Saturday March 2. A terrific previous presentation is "The Bachelor: Reconstructing a Solitary Life Using Obscure & Far-Flung Records"
Wow - you described everything I admire about Megan and her work so well! She is also kind and generous, always motivating, and just a great person to work with and call friend. What is Your #1 Source for Genealogy Education? Ellis Island: Did They or Didn't They? What is Causing Your Brick Wall? Who Do You Think You Are? Starts Tonight! Bloggers - Where Do You Prefer to Get Comments?